Flavor: There's always a lightly delicate but piquant flavor which accompanies a Virgo, some would suggest it is the aroma of a cleaning fluid of some kind. Grocery store: If you go grocery shopping with a Virgo, be prepared to read the labels. Or be prepared for the Virgo to read the labels. The packaging itself doesn't matter, it's what's inside that counts, and this is what the Virgo seeks to find out. Wal-Mart, after midnight: Ever been shopping with a Virgo? Ever think about the number of times someone can squint at a label, and wonder just exactly what part of which animal those things came from? Imagine the scientific curiosity at work here. There's another problem, though, and one that suggests the results are not all in yet, that this an area which is going to require further research. "I'm not going in a Wal-Mart, please don't make me go there," I heard one Virgo girl whine. Good stuff, cheap, didn't quite work on her. The results are still up for study, as of right now. And most of the Virgo girls I know wouldn't be up after midnight, anyway, not if there was something else to do, like sleep. Brick wall: When a Virgo encounters a fixed, immovable obstacle, there is but one solution. First, this brick wall must be disassembled, one grain of mortar at a time. And each single grain of sand that makes up this wall needs to be properly stored and labeled so that it can be reassembled later. Or so that whoever caused this obstacle can be found out and blamed. In any case, the Virgo will assure that this is all done perfectly. Body part: Viscera. Although Virgo can be altruistic, they have a tendency to act the martyr, using guilt as a weapon. Although adaptable to change, they can be vulnerable to the influence of other people. A Virgo will always find ways to be useful. And although shy, Virgos are idealistic and communication-oriented with an ability to sell. Always practical, they would be an effective negotiator because of their ability to instinctively respond to the needs of others. And they can endure endless details and responsibilities. The Virgo analytical ability is amazing. A Virgo can seem quite talkative. They also have a penchant for books, magazines, and writing. There is an omnipresent critical eye for organization and detail. This can come across as an irresistible urge to improve everything and everyone. Not all Virgo's are neat freaks, though, and some can be quite sloppy, disorganized, and irresponsible. They've got this hypocrisy thing, don't they? Like a drill sergeant gone haywire, a Virgo can address someone's bad habits but then they have the same bad habits themselves. They are us usually health conscious and not overly competitive. Virgo may be a craftsman, seamstress, or designer. Virgos usually have a fond interest in cartography, travel, or philately. I lived in an apartment once with a property manager who was a Virgo. True to form, she had been in her new office for about 20 minutes when she calls me up and says, "You realize that you still owe the other half of your pet deposit?" This is a fine example of your Virgo attention to detail. I had neglected to pay that second half of the pet deposit for more than a year. Didn't get it past her Virgo eye, though. Bernstein, Dvorak, and Charlie Parker were all Virgo's. But for Virgo listening pleasure, try: Hayden's "Symphony No. 104," or Brahm's "Symphony No. 4." Maybe some Enigma, too. Any good Virgo will also go crazy over Gregorian Chants, too. Famous folks with Sun in Virgo include: Michael Jackson, Charlie Sheen, Prince Albert, Fiona Apple, Lauren Bacall, Anne Bancroft, Debbie Boone, Tim Burton, Nell Carter, Maurice Chevalier, Sean Connery, Harry Connick Jr., David Copperfield, Elvis Costello, Jane Curtin, Brian De Palma, Cameron Diaz, Greta Garbo, Mitzi Gaynor, Richard Gere, Barry Gibb, Johann von Goethe, Samuel Goldwyn, O. Henry, Buddy Holly, Gustave Holst, Chrissie Hynde, Julio Iglesias, Jesse James, Tommy Lee Jones, Ken Kesey, B.B. King, D.H. Lawrence, Huey P. Long, Marylin Manson (Brian Warner), Rocky Marciano, Freddie Mercury (Farrokh Bulsara), Christopher Moore, Van Morrison, Bill Murray, Merlin Olsen, Kneau Reeves, Paul Reuben (Pee Wee Herman), Ann Richards, Jimmy Rodgers, Adam Sandler, William Saroyan, Peter Sellers, Mary Shelley, Upton Sinclair, Leo Tolstoy, Lily Tomlin, Twiggy, Raquel Welch, Tuesday Weld, H.G. Wells, and Hank Williams. There is a wealth of information available on Kramer's website, astrofish.net. Online since 1993, it's one of the longest running horoscope sites. Kramer is available for questions, readings, and his books are for sale. VIRGO can do without chaos. Disorder and disarray chafe his or her organized nature. An earth sign, Virgo is practical, orderly and clean. Communication is essential, but for reasons beyond the social,e Virgo uses the preciseness of words to make lists, to be a critic, or write about how to stay healthy. Talking must produce results or Virgo will be silent. Shy, with high standards, Virgo is the perfectionist. Being perfect does not come easy and often leaves Virgo on the sidelines reluctant to be imperfect. This creates an aura of humility that protects Virgo from the criticism of others. Work suits Virgo folk; he or she has good ethics when it comes to getting the job done correctly. Details and discrimination are key to Virgo's success. He or she is meticulous and service-oriented in their careers. Some have been called workaholics, but this is not a bad characteristic. Virgo can stay focused and complete all tasks. Prone to worry, the health of a Virgo can be compromised by imagined or exaggerated illness. Despite hypochondriac tendencies, Virgo is usually very healthy. When health is an issue, it is often related to the digestive system. This sign internalizes and this can lead to manifesting physically as ulcers. If you love a Virgo, be patient. Love is the medicine for all hurts real or imagined. Do not take criticism personally; learn to deflect words said in haste. Let it all just roll off your back. The reward of this union will benefit you in many ways, clean undies, and low cholesterol for starters. Astrology Books and Horoscope Guides for Virgo at Amazon. Compatible Star-Signs: Taurus, Capricorn, Cancer, Scorpio. Virgo has been called picky and critical for far too long. Well, here's where it ends. This sign's certainly into details -- there's no doubt about that. But that doesn't mean that these idealistic, humble folks don't care about others; in fact, it really means that they care so much about helping everyone look, sound and be their best that they're willing to risk coming off as 'picky' or 'critical' to do it -- which is quite a generous sacrifice. Truth be told, however, Virgo's good at sacrifice, and at making lemonade out of lemons. These extremely tender hearts are always willing to help, and their sharp focus allows them to take charge of even the toughest situation. So if you're a Virgo yourself, you know that when you're that good at grasping particulars, it's quite natural to see flaws -- hence that reputation for being nit-picky. But if it weren't for you, the rest of us would miss the trees for the forest, so don't ever let anyone put you down for your keen eye! We all need troubleshooters in our lives, people who are able to see the potential problems in a situation before they develop -- and that's definitely Virgo. So get out there and find one of these meticulous folks; enjoy a lesson in careful observation and tell your pal that their ability to appreciate minutiae really is precious. When it comes to relationships, Virgo is as devoted as a sign can possibly be. These sincere souls are willing to do whatever it takes, whenever it's needed, to let their beloveds know just how dear they are. And if you're close to a Virgo, you can attest to the fact that they're the proud bearer of one of the keenest wits in the entire zodiac, thanks to that sharp eye and those quick, accurate comments. As a partner, this sign's as faithful as they come -- like all the earth signs. (Don't forget: Being earthy, after all, means that Virgo was given the gift of fully appreciating the sense of touch and the importance of closeness.) So don't hesitate to reach out and touch a Virgo you know and love -- and let them know how valuable they are to you. 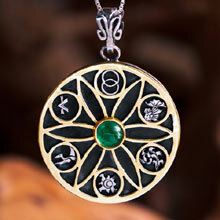 The sixth Sign of the Zodiac which also rules the sixth House, the House of Health. Virgo is ruled by the Planet Mercury, Mercury being the Messenger God in Roman mythology. In the Zodiac Virgo is opposite Pisces. 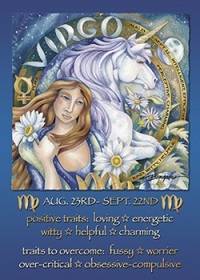 Virgo is the sign of the Virgin, shy, nervous and repressed, while being practical and logical. Drawn to work with projects and individuals they Serve with reasoning and analytic ability. They are detailed and precise, sometimes fanatically tidy. They have a desire for perfection and an enormous attention to detail. They perceive the world through intellect and because of this they tend to be very judicial. They are skilled at communicating. They are devoted and sometimes jealous. Virgos Serve, in such a sense that they can lose themselves totally in the nature of the work that they have set themselves out to do. They need diversion, activities, fun, hobbies to broaden their lives and are unhappy when they are wrestled away from the grindstone. Their jobs become their lives. If they are unemployed they totally lose their reason for being. Since they are so wrapped up in their jobs to the exclusion of everything else they should find jobs which are well - rounded and give them exposure to the rest of the world. Virgos are fanatic about cleanliness, perceived or real, and may develop phobias about hygiene and sanitation. Conventionality and a strict adherence to society's rules and regulations are what to expect from a Virgo mate if they have not progressed along life's learning path. They are very observant, shrewd and critical of anything outside of their own beliefs. Outward signs of affection are difficult to express, which may give the impression of coolness and of being too reserved. They conceal themselves from the outside world because of fear and distrust; they are very afraid of being hurt, because it is so difficult to form new relationships. They are sensible and discreet and great at giving advice to others that they actually need themselves. They must be careful not to have relationships with more passionate partners, because they cannot adapt to extreme passion. Because they are so meticulous they lose sight of larger issues, and meticulousness itself becomes their focus in life. Virgo is the sixth sign of the Zodiac and is represented by a female. The Sun is in this sign from August 23rd to September 22nd making individuals born in this period Virgo. Virgo is one of the earth signs making them close to nature and the world around them. Virgo men are normally most compatible with Capricorn and Taurus women. Virgo men, like all other men, have both a positive and negative side to their character. There is little that can be done to influence either the positive or negative side of their character. In many cases the negatives are caused by too much positive energy. Virgo men are dedicated and devoted. They will do whatever they can to protect their family and loved ones no matter whatever challenge they may face. Married with this devotion is an intellectual and an attention to detail which Virgo men can succeed both at work and home. Virgo men have an analytical and measured approach which makes them excellent problem solvers and shrewd in difficult situations. These characteristics mean some are fantastic lawyers. They can sometimes be too devoted and over proud of those around them. This means Virgo men will often gloat about their life causing those around them to resent them. The devotion can also make them over-protective and likely to take retribution, ranging from murder to petty and pedantic remarks. Overall, Virgo men love and are devoted. It is important to have your own space and not to allow jealousy to develop. Moreover, they are proud men so they want to be in a relationship with a woman who makes them proud.